For The Hobbit enthusiast in you, there is no better place to be than here. Not only do we have a wide selection of Hobbit stuff, but we also have a section wholly devoted to great Hobbit collectibles, which you can find right here! Located in this category are all sorts of little intricacies and objects that are bound to pique your interest! Already a work of masterful fantasy and fiction, The Hobbit film, directed by Peter Jackson, has served only to enhance the storys following, and now, objects seen from within that film can be yours in the form of several of our own great collectibles. We offer several of some of the more noteworthy items from the film, including appealing little trinkets like the very key to Erebor that Thorin Oakenshield carried, done in beautiful cast metal. Of course, we have more than just the legendary key, including a recreation of the map Thorin used to reach Erebors hidden door, as well as a map of Middle-earth itself, both scrawled onto quality parchment and designed to look ancient. And these are only a few of the options you will find here in this category. Stunning in their detail, each and every one of the Hobbit collectibles you will find here are all amazing works, ones that will no doubt attract fans and fanatics of the Hobbit novel and the Hobbit films from far and wide, all so that they might claim a piece of the legendary story and make it a part of their everyday life and decor. For one who rarely ventures beyond his own home, an epic quest to save the kingdom goes beyond all comfort. 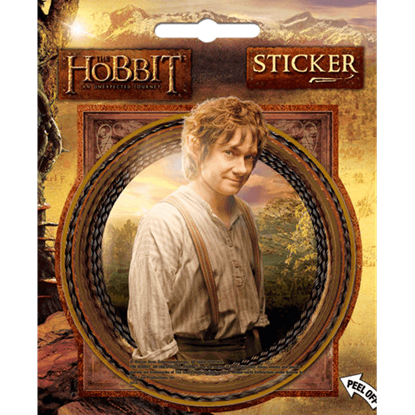 The Bilbo Baggins of the Shire Sticker captures the image of the simple Hobbit that discovered the clever hero within. For nearly 60 years, the Lord of the Rings has been a definitive example of high fantasy in fiction. 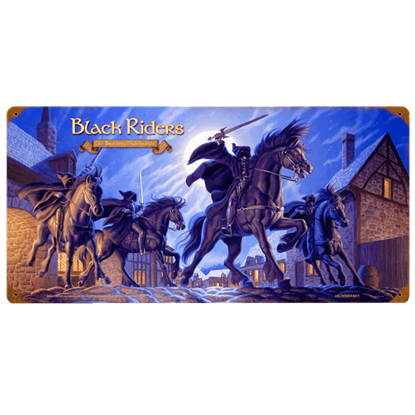 Now you can make your favorite event or scene in the story a part of your decor with this Black Riders LOTR Vintage Metal Sign. 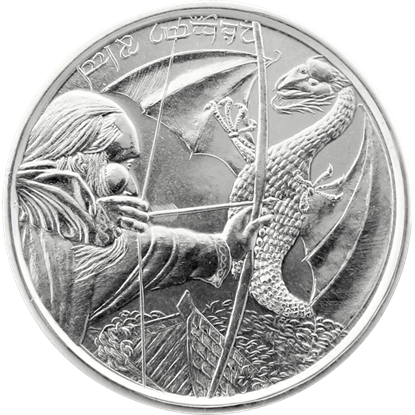 The Daler of New Dale Coin is struck in one ounce of pure .999 silver, making the Hobbit coin a gorgeous piece of currency for fans of Tolkiens intricate world. The round fantasy coin displays excellent detail on both sides. Catchy phrases and iconic images are evidence that a movie series has gone epic. Unforgettable moments deserve display wherever fans please. Treasure your epic favs from the Hobbit series with the Desolation of Smaug Button Set. For nearly 60 years, the Lord of the Rings has been a definitive example of high fantasy in fiction. 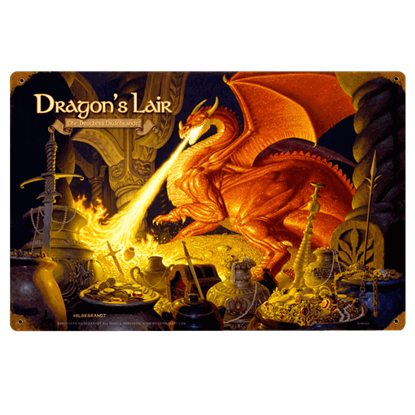 Now you can make your favorite event or scene in the story a part of your decor with the Dragons Lair LOTR Vintage Metal Sign. 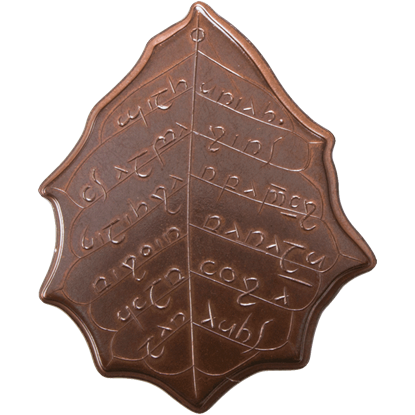 Struck from solid copper using antique machinery and traditional coining techniques, this Elvish Fall Leaf of Holly is a collectible piece of currency modeled after those made by the Noldorin Elves from the land of J. R. R. Tolkien. 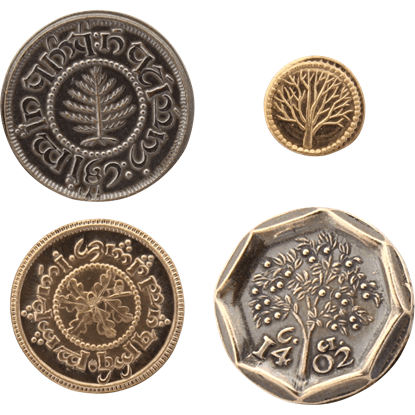 Add a bit of fantasy to your coin collection with this Elvish Four Leaf Coin Set. 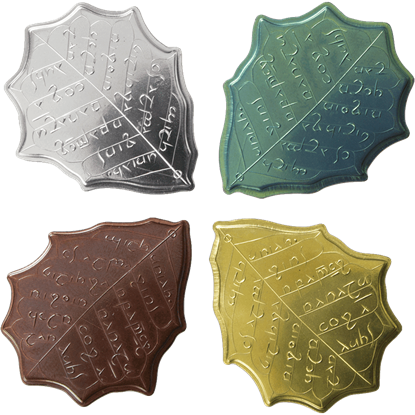 These licensed coins were made by the Noldorin Elves while under the rule of Celebrimbor, the great Elven-smith and forger of the Rings of Power. For nearly 60 years, the Lord of the Rings has been a definitive example of high fantasy. 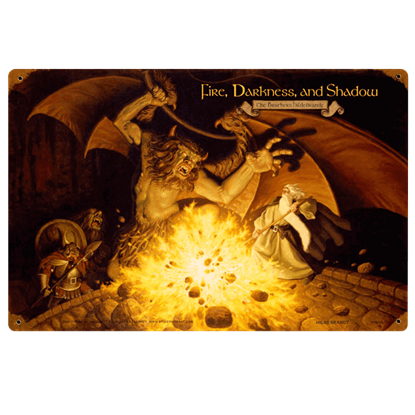 Now you can make your favorite event or scene in the story a part of your decor with the Fire, Darkness, and Shadow LOTR Vintage Metal Sign. 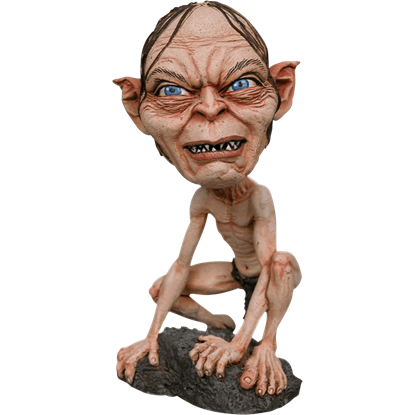 Featuring your favorite Hobbit from the classic Lord of the Rings trilogy, the Gollum Headknocker depicts the elven trickster in amazingly lifelike and movie accurate detail, making him the perfect accent for your home or office decor! Dain Ironfoot was one of the greatest Dwarven warriors in Middle Earth. As Lord of the Iron Hill Dwarves, Dain led his army in the defense of Erebor. 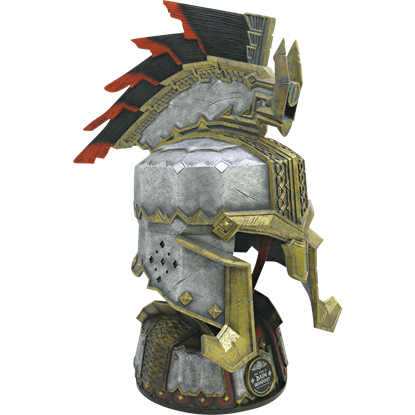 The Helm of Dain Ironfoot makes a terrific addition to any Tolkien collection. The Hobbit Coin Set 1 brings the world of Middle Earth to life in a whole new way for fans of Tolkiens incredible fantasy tale. The collectible coins include four different currency denominations from the peaceful Shire. 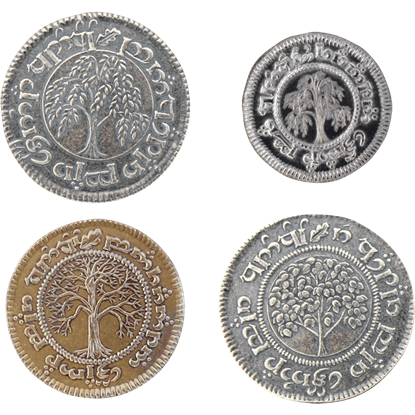 The Hobbit Coin Set 2 celebrates Tolkiens masterful fantasy world with a selection of four coin denominations from the peaceful Shire. The beautiful collectible coins allow fans to bring Middle Earth to life in a fresh way.